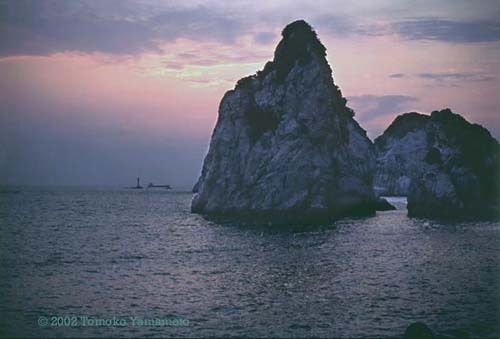 Tategoiwa is a limestone rock off the coast of Shirasaki, Wakayama, Japan, famous for white rocks along the coast and popular with divers. The shining white coast line attracted a Manyo poet to write a poem, which I have set to music. This photograph is one of several parting shots of Tategoiwa I took handheld as I was walking away to meet my taxi at Manyo Park. The film was Fujichrome Provia 100F RDPIII. The camera was the OM-4Ti with a 50mm/1.8 lens. Digitally made Lighjet prints on Fuji Crystal Archive papers will be available for order. The print is signed on the back by the artist with the title and printing date. No copyright mark is on the print.